Whether it is in the ripple of light across the surface of a lake, the gaze of a beloved pet, or the reassuring words of a trusted mentor, every single moment is a potential gateway to a deeper connection with life. 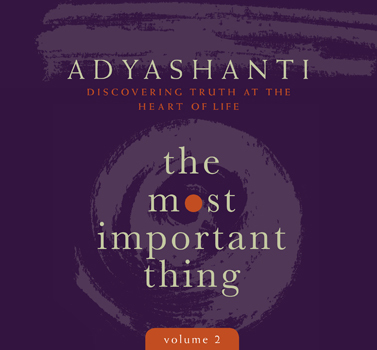 In The Most Important Thing, spiritual teacher Adyashanti presents two volumes of deep examinations of what calls us to look inward and connect with the truths that fundamentally animate us. Through evocative teaching stories and considerations of real-world events, Adyashanti illuminates the possibilities inherent in examining that which we want to serve, the revelations brought by difficult times, and opening to the unexpected arising of grace in all its forms. Over the course of more than two dozen unique explorations, The Most Important Thing offers doorways to that which is already alive and waiting within you: the truths that fuel the most authentic expression of your life.